The fonds consists of a box of artifacts and photos. Items that have been photographed and cataloged are indicated with an * on the list of holdings below. 1-1966 religious calendar/diary (“Native Land”-English translation) from the Institute of St John; contains pictures of churches, constitution of the masons & other information of interest. 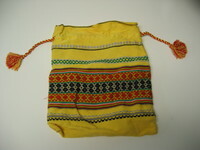 A photograph of a woven yellow bag with tasseled drawstrings and an embroidered Ukrainian design. 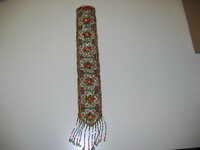 An image of a 14 inch length of beadwork with a Ukrainian design down the middle. 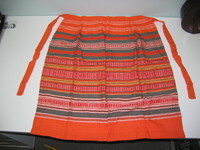 A photograph of a colourful orange apron with a grey and white design.